A Successor for Mr. Ratan Tata - Who will Fill in the Shoes? Time has come for the India’s biggest and most respected business conglomerate – Tata Sons – to start a hunt for a new chairman in place of Mr. Ratan Tata, who retires at the age of 75. As most people are aware that the Tata Group is involved in almost all the varied sectors of the economy, right from the Automobiles to InfoTech to even common-man’s eatery – Salt. From being an India-centric company, the Tatas have gone far-and-wide across the world with their acquisition of globally renowned brands such as Jaguar Land Rover (JLR), Steel group- Corus and Tetley Tea among many others. As was revealed by Mr. Ratan Tata, almost 65% of the revenue of more than $70 billion now comes from outside of India, but the company still has its headquarters in the Tata House in Mumbai. With the change of guard the company seeks to have a more defined Global image keeping in view its growing global businesses. A five member committee has been established to nominate a successor for Mr.Ratan Tata. Though, the names of the members of the committee have not been officially revealed, according to well informed sources these include R Gopalakrishnan and R K Krishna Kumar, both executive directors of Tata Sons; N A Soonawala, who retired last month and will represent Sir Dorabji Tata Trust; and A N Singh, managing trustee of Sir Dorabji Tata Trust and J R D Tata Trust. Mr. Nusli Wadia, the chairman of the Wadia group would be the outside candidate in the committee. Mr.Ratan Tata himself is not part of the committee but he would have an advisory role. The majority of the shares of Tata Sons, their holding company, are still held by Parsi family trusts and that most of the board members have been Parsis as well. Due to this fact, the Parsi community has always had a major influence on decision making in the conglomerate. But, Mr.Ratan Tata has now said that he expects the new chairman to be neither pro-Parsi nor anti-Parsi, indicating that the company wants to move-on from its image of a company run by Parsis-only, in a move powered to give its board a more cosmopolitan look. He also signaled that for the first time in the history of the group founded in 1868, there could be a non-Parsi chairman. Tata sons have also said that while selecting the new chairman, the company would keep in view it’s global presence as well as the complexities of its varied businesses. Mr.Ratan Tata also stressed that the company should go into good hands and the fact that the good leadership would continue. An able leadership is essential to replicate the stupendous growth that was seen at Tatas with Mr.Ratan Tata at helm. “The group would require someone with experience and exposure to direct its growth amidst the challenges of the global economy. The selection process for a prospective candidate would consider suitable persons from within the Tata companies, other professionals in India as well as persons overseas with global experience,” Tata Sons said. 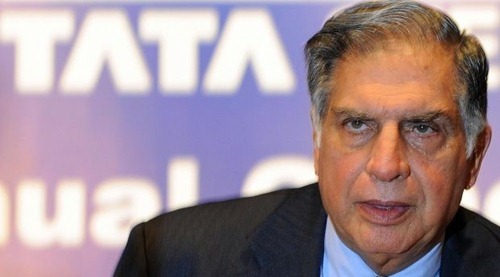 The new Chairman is expected to succeed in March and would be advised by Mr.Ratan Tata for some time. One thing is for sure, no matter who is selected to head Tata Sons, filling the shoes of his predecessor would be one tough job. Mr. Ratan Tata, his first name “Ratan” means a Gem in Hindi, was truly a gem of India’s industry. His successor has his job cut out for him. What do you think – Who will step in his shoes fruitfully? Prashant Mathawan is a freelance writer based in Gurgaon with an interest Global Affairs and Politics. RATAN TATA IS RATAN TATA. NO one can do the business as he had done. Futher of tata is a big question mark. ys..ratan is eal gem to india and for india…. Tata is a real business house, but their current management of marketing needs a lot of change. They can save wastage of Telephone and other communication expenses. Specially their Tatasky and Tata AIG needs Mr. Tata's attention. If Mr. Tata can spare a few moments I want to give some suggestions on the subject. At present I am being hsrrased by Tatasky who have no one to attend to customers and guide them properly.For last 15 days my DTH is lying disconnected for want of a proper person to tell me what are the packages that I can choose from. None can force me a package which I do not want. I need Mr. Tata to look into the matter and rectify the anomaly. Everone in India does not have a computer to surf the websites, and most of the websites are not user friendly. The online sales are not suitable in India. It is waste of money and annoyance to customers. They should make it a reality show. The whole selection process!! They can cover the programme on TV till March 2011 and reap moolah for the loss making Tatas. Forty-four years of age, born on 7th of April 1966. Brought-up in a family of intellectuals, where essence of education lies not merely in obtaining degree but in developing individual talent & personality. Basic schooling and further education from all reputed institutes of Nagpur, Viz. Somalwar School, Hislop College, G S College and Dhanwate National College. Grown up to be a matured forward thinking person with adaptive, self-confident approach. 5)	Certificate of Training – ISO/TQM – Conducted by SISI, Govt. of India, Ministry of Industry. 6)	Certificate of Training – Marketing Management – Conducted by SISI, Govt. of India, Ministry of Industry. 1] “B” Certificate from No – 2 Mah. Air Sqn NCC, Nagpur. 5)	Upliftment of Addicted persons & their rehabilitation. •	Good Drafting, Computer & Writing Skill. •	Ability to make effective Personal & Group Presentations. •	Communicating effectively to Co-workers, Superiors & General Public. •	Ability to Analyze & Interpret. •	Managing & Supervise NGO/ Teams, Evaluating Staff & Providing Technical Guidance. •	Providing Leadership & Motivating Qualities. •	Providing Right Directions & Guidance to Staff. •	Extending full support to Management to implement Work Procedure. •	Ability to Co-ordinate with Government or Private Agencies. •	Worked as Manager Human Resource Department – Daily Human Right News-Kolhapur-Satara-Sangli- Now Industry is closed. Possessing high academic qualifications in Management Science. More than twenty-three years of experience in various fields like – Marketing, Administration and Teaching in Indian & Multinational Pharmaceutical Companies, Premier Law Reporters & Publishers and Education Institutes. Even today, I have realized that my Potential has not been utilized properly. I believe in Modern & Competitive vision, which revels the Global Movement and how the expanding technology is propelling the Business World into an existing new economic Era. How every Manager can and must stay ahead of the curve which can help the Organization to make a quantum leap in efficiency, growth and profits – in turn to achieve the pre-determined objective. Always a positive thinker, to give unselfishly to others, helps them to achieve their Goals and Objectives. Effectively implemented Manisana Award for Print Industry, as one of the Member of Wage Board Committee.